On the cusp of commercial production, Flosfia gets set to deliver the highest performing power semiconductor yet, reports Rebecca Pool. Commercial production of cheap and high performing gallium oxide power devices will take place later this year, if Kyoto University start-up, Flosfia, lives up to its latest promises. Talking to Compound Semiconductor, vice president of marketing, Takuto Igawa, says: "We have a very good relationship with a domestic foundry, have started production and will see commercial production of our Schottky barrier diodes by the end of this year." "We can't disclose details but this is a global foundry and our customers will be happy," he adds. "Operations will start on a domestic scale but we will expand production both physically and globally. We are seeking partners that can maximise our production capacity"
Flosfia impressed industry pundits in 2015 when it released its first corundum structured gallium oxide device. The 521 V Schottky barrier diode (SBD) had an on-resistance of 0.1 mÎ©cm2,, lower than that of any commercially-available SiC diode. At the time, Flosfia director, Naonori Kurokawa claimed a 600V 5A SBD 'was almost ready'. And now, Igawa confirms these diodes are now good-to-go and ready to rival silicon and silicon carbide counterparts. "One of our first target markets will be the AC adapter for consumer use... and once we reach full-scale capacity on our production lines in 2020, we are highly confident that we will have also reached cost parity with silicon devices," he says. Flosfia's intent to release its cool, new devices this year follows its latest funding round in which it bagged JPY 800 million - US$ 7.4 million - bringing total investment funds to a hefty JPY 2.26 billion (US$20.8 million). According to the company, that latest capital will be used to develop its production lines, at its partnering foundry, ready for imminent commercial manufacture. And with its SBDs in production, Flosfia then intends to sample MOSFETs in 2019, with commercial production scheduled for 2020. Flosfia's success hinges on its novel Mist Epitaxy CVD process, used to deposit dislocation-free layers of Î±-Ga2O3 onto four inch sapphire substrates. Here, a mist of metal compounds is injected into the reactor chamber, which decomposes when it reaches the heated sapphire substrate to form gallium oxide layers. As part of this, Flosfia co-founder, Professor Shizuo Fujita, pioneered a 'lift-off' proprietary process to transfer the Î±-Ga2O3 layers onto a highly conductive metal support, alleviating thermal management issues and enabling operating at a lower temperature. 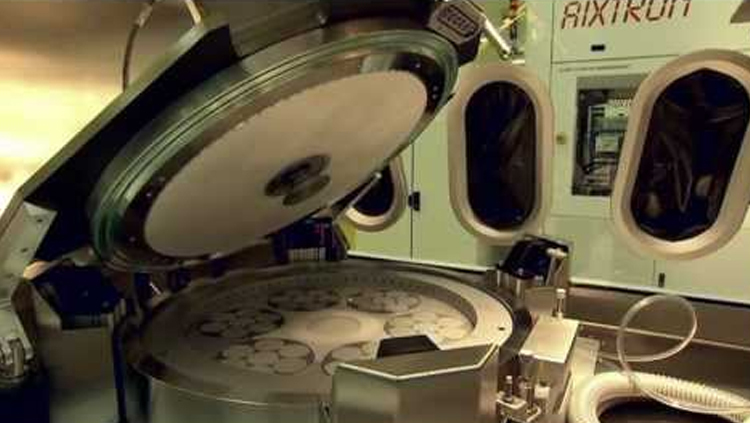 Crucially, this process has now been honed for the high throughput and easy-handling of wafers, and as Igawa asserts: "this process is included in commercial lines." So with the process ready, and commercial production nigh, the future looks bright for Flosfia. In conjunction with its latest funding round, the company has also joined forces with Japan-based automotive systems supplier, Denso, to develop gallium oxide devices for power control units in hybrid and electric vehicles. Alongside Mitsubishi Heavy Industries and Japan-based venture capital firms, Denso is a key investor in Flosfia, and according to Igawa, is keen to implement the company's diodes and MOSFETs in its power systems. The Flosfia vice president will not be drawn on device performance specifications or any further detail, simply saying, 'we do not with to cause confusion at this stage'. However, he also points out how both partners are keen to reduce the energy losses, cost, size and weight of inverters used in electrified vehicles. "We are very, very interested in the automotive market," highlights Igawa. "We cannot discuss details but we can say we have mutually agreed to launch gallium oxide power systems for automotive applications by 2025."